If you are looking for the best deep fryers for home use then we have researched and tested dozens of them, and here is our list of the perfect deep fryers that you can use for your daily home frying. Below is a description of each of these deep fryers and why they are the best deep fryers for home use. If you are looking for the ultimate deep fryer for home use then the T-Fal Ultimate Immersion Fryer should top your list of deep fryers to consider. It boasts a 1700 watt heating element that is perfect for frying 2-2/3 pounds of food that the fryer can handle at full capacity. It has all of the standard features that you’d look for in a home deep fryer like an adjustable thermostat, ready light, and external basket handle. But one of the cooler things included is an integrated oil drain that filters the oil as it drains and stores the oil for future use. The lid also seals to prevent splashing while still allowing you to see the food through the large viewing window. The T-Fal Ultimate Immersion Fryer is a great solution if you are looking for a professional style deep fryer that will enable you to cook 5 Star-quality fried foods at home. It has a large frying basket that can accommodate all of your favorite foods. Flexibility is provided by the unit’s adjustable thermostat. It uses a temperature-ready light that alerts you when the oil is the correct temperature for you to start cooking. A really great feature of the product is how it manages oil. It automatically drains and filters the oil into an integrated oil container and stores it for future use. This means that users never have to touch the oil. All the parts (except from the heating element) are dishwasher safe so cleaning up is a breeze. The detachable magnetic plug and the external handle of the basket cater for safety. Taking on our second spot for the best deep fryer for home use is yet another favorite from T-fal. The T-Fal ActiFry is described as a low fat cooker that enables you to create delicious meals that are also healthier than those made using traditional deep fryers. If you like French fries then you can look forward to the tasty and crispy fries that you will be able to make with this cooker. You can make two pounds of fries with just one tablespoon of oil! That’s just a 3% fat serving! A traditional 3-litre fryer will use about 200 times as much oil as this cooker and the T-Fal ActiFry is therefore better for your health and your wallet. But it’s not just for fries. You can use this appliance to cook healthy full meals such as chili, risotto, and seafood. This nifty little fryer is also very easy to clean up after use. It has a removable bowl, lid, filter, and teaspoon – all of which are dishwasher safe. You also receive a booklet with 30 different recipes to give you some ideas and advice for making delicious and healthy meals. Safe and easy to use – no preheating required, simple temperature control, one time use of oil. The Hamilton Beach 12-Cup Fryer might be just what you are looking for if you are in need of a product that will enable you to create mouth watering, crispy, delicious fried food at home. Not only will it provide you with great tasting food but it also operates without creating the mess that you may have associated with other deep fryers. A great feature of this deep fryer is that you can raise and lower the frying basket while the lid of the machine is still closed. In this way you can cook your favorite foods without having to worry about the splattering of oil. This reduces mess and is also an important safety feature. It can be completely disassembled after you have finished cooking, which makes cleaning up even easier. Yet another good deep fryer for your home use if this Secura Triple Basket fryer. The Secura 4.2L Stainless-Steel, Triple-Basket Deep Fryer is a perfect fit for larger families that enjoy the taste of fried food. With the machine’s jumbo basket you can fry up to a 4L capacity. It also comes with two smaller baskets that you can use to fry two different foods side by side – a great feature if you ask us! We have done significant research to determine what customers think of this deep fryer – and it turns out that they love the food that it makes. You won’t have to worry about the danger and inconvenience of spilt oil because the machine’s lid is ‘splatter proof’. Another safety feature of this deep fryer is its magnetic plug. This means that if you knock the item onto the floor the plug will detach itself and won’t create the danger of electrified oil spilling on your floor. Yet another is its timer that automatically turns off the fryer just in case you leave it alone for too long. The fryer is comprised of a stainless-steel body and a clear viewing window which allows you to view the food while it fries. The carbon filter will reduce odors that are common with deep fat fryers. You can fry up to 4L of food with one big basket. Alternatively, you can use two baskets side by side to fry different types of food. This is handy if the food types need to be fried for different times. Oil temperature is heated quickly and is maintained efficiently using a 1700-watt immersion element. Comes with a 4.2-liter oil tank that can be removed to make cleaning easier. You can adjust the temperature of the oil between 250 and 375 degrees Fahrenheit. Window in lid allows you to observe food while it fries. Comes with an odor filter. The ‘oil ready’ light lets you know when the fryer has been preheated. Automatic timer functions up to one hour. The Masterbuilt 20010109 is a result of the teaming up of Masterbuilt and Butterball to create the best performing electric turkey fryer that can be safely used indoors. This deep fryer is very easy to use and will provide you with delicious deep-fried turkey in a safe manner. You will appreciate how easy this machine is to clean up after using it and its efficiency in that it uses one third less oil than conventional turkey fryers. Are you looking for a fryer to make delicious food that is also safe, simple to use, and easy to clean? If you are, then you should read on and find out about the DeLonghi D895UX electric food fryer. An excellent feature of this product is its rotating basket. The benefit of this is that you only have to use half of the amount of oil that you would usually use. You also end up with food that isn’t very greasy but still tastes great. Another benefit of this fryer that you will surely appreciate is just how easy it is to clean. After you have finished frying your favorite food you can use the product’s oil draining system to safely and easily drain and recycle the oil that you have just used. You simply open the door on the front of the unit and a tube will fold out to drain the oil. The lid and frying basket of the product are also dishwasher safe. The fryer has a number of safety features such as its magnetic AC power cord that easily detaches if it is pulled. The sides of the fryer remain cool and it has non-slip feet. To prevent splattering the fryer has an external handle that can lift and lower the basket while the lid is closed. It also has two replaceable filters that prevent the release of oil vapors and odors in the kitchen. Other features of the product worth noting include its adjustable thermostat, digital timer, and viewing window. To close our list of the best deep fryers for home use if this superb fryer by Waring. 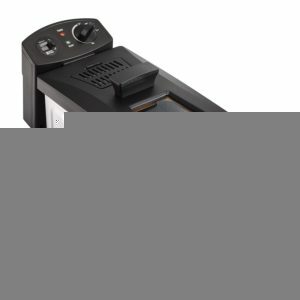 WaringPro DF-250B 1800 Watt Fryer. Here is a deep fryer that uses an 1800-watt heating element to heat oil quickly that will cook up to 2 ½ pounds of food crisply. It’s easy to use and all you have to do is place food in the basket, lower it into the hot oil, and monitor it through the viewing window. It has a domed lid to catch condensation and funnels it away to reduce chances of splattering. Some safety features of the deep fryer include its breakaway cord, its auto shut-off protection, and its safety interlock system. It also has a 30-minute mechanical timer, a collapsible cool-touch handle and is almost completely dishwasher-safe. It comes with a limited warranty of one year. Deep fryer comes with a 1-year limited warranty. 30-minute timer that allows you to cook your food for the perfect length of time. Dishwasher-safe parts means cleaning is easy. 3-foot magnetic plug for safety. Whether you are hoping to buy your first deep fryer or you need to replace one that has passed on to fried food heaven, there are several things that should be taken into consideration in order to find the best deep fryer for you. I’ve spent time considering fifteen different deep fryers that come in a variety of price ranges and feature sets and I feel pretty confident in being able to help you determine the right kind of deep fryer that will meet your needs and satisfy that desire for deep fried goodness in your own kitchen. The first thing to consider when you are in the market for a new deep fryer is how much cooking capacity you will need. 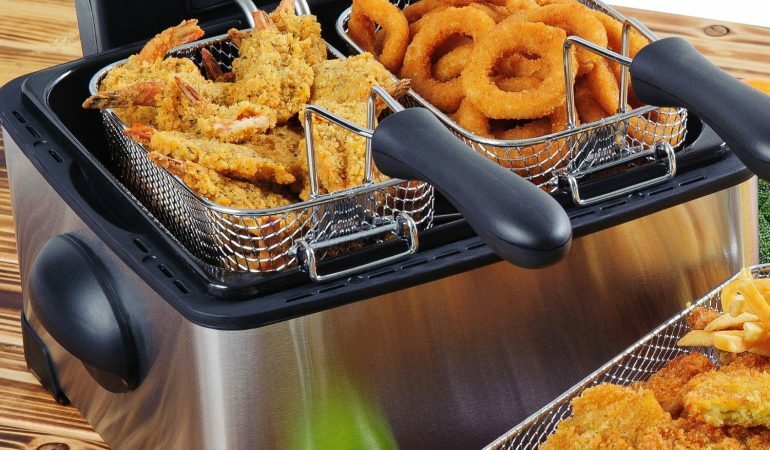 Deep fryers can be small single serving units like the Presto 05420 FryDaddy or they can be larger capacity restaurant style double basket units that are suitable for large families or entertaining guests. There are of course a myriad of choices in between. The second most important consideration is the included features in a potential deep fryer purchase. Things like a magnetic release cord and an adjustable thermostat are nearly universal to deep fryers. Filters are fairly common on many units as well. Some deep fryers like the Emerilware Deep Fryer has a built in drain and filter for the oil. At the other end of the spectrum are the simple kettle cookers that often have no additional frying features but can sometimes be used for a variety of cooking methods, such as Presto’s Multi-Cooker. I enjoy using this unit for steaming rice in addition to using it as a deep fryer. One drawback of simple kettle cookers like Presto 06000 Multi-Cooker is that aside from the magnetic release cord, there generally aren’t any additional safety features. These deep fryers are little more than a metal pot and as such the outside surface gets extremely hot. Not that you’d intentionally allow your child to touch any deep fryer while in use but some units specifically stay cool to the touch on the outside and can give a small amount of peace of mind to parents with small children around. Deep fryers are not often associated with healthy eating but there a couple units that specifically cater to health conscious consumers. One of those is the George Foreman GSF026B Deep Fryer which features a spin cycle at the end of the frying process to spin-away much of the fat that is absorbed during the cooking process. The George Foreman deep fryer could make a good gift for someone who might not otherwise even consider buying a deep fryer. The last thing to consider and the most important thing to a lot of people is price. Once you’ve decided what capacity you need and which features and safety considerations you want to have in a deep fryer it is then time to decide how much you’d like to spend on a deep fryer. Thankfully there is a wide range of fryer’s available from a variety of manufacturers and finding the best deep fryer for you and within your price range should be fairly painless once you’ve determined what you are looking for. Hopefully, after reading this you have a better idea of things to take into consideration when you want to purchase a deep fryer for your regular home use and can truly find the best deep fryer for you.